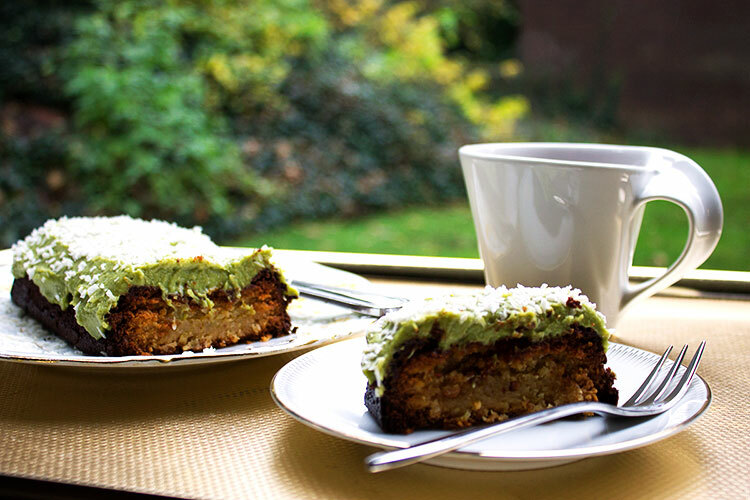 A gluten-free and dairy free lime and coconut loaf that’s perfect for afternoon tea. Or whenever really. I’m trying to update the old twimii recipe list and either correct the recipe or offer something better. One of the recipes is for avocado yoghurt which is made with a blend of avocado, dates, lemon juice and almond milk. It was okay but when I made the only alright vegan green tea brack I used a topping made with a blend of avocado, coconut oil, a little green tea, lime juice and zest, and maple syrup which I really liked. While the vegan green tea brack wasn’t great I used the topping on a lime and coconut loaf and it worked out great. I like this topping so much that I’ve named it – sweet avocado and lime cream and it’s definitely my preferred alternative to the old avocado yoghurt. One thing I should say though is that it is not easy to get the avocado cream totally smooth if you have a standard blender – as opposed to the ones that cost hundreds of euro. So if you have a standard blender do mash up the avocado well before adding it to the blender. I also put the cream into a little electric spice blender I have, after having blended it in the large blender and this seemed to do the trick. Although I had posted a photo of the lime and coconut loaf on abitmoreveg I never actually posted a recipe. So I made it again today. When I made it the first time I only had about 80g of ground almonds left so I made a tiny loaf with this and some desiccated coconut. I cooked it in a 7.5″ x 4″ loaf tin (it’s made of glass but it’s a loaf tin) and it’s only an inch or two in height. So it’s a tiny loaf but it’s full of flavour and I didn’t increase the ingredients because I don’t think it would have the right consistency if I did. It’s baked for a long time so the edges are dense and crispy but then it’s fudgy at the centre and I think if it was any larger it wouldn’t work. And this really works. It’s yummy. If you like tangy sweetness you should love this. Ground almonds, desiccated coconut, vanilla extract, regular olive oil, coconut oil, limes, avocado, maple syrup, green matcha tea, caster sugar and an egg. Makes a 7.5 x 4 inch loaf. Turn on the oven to 160 C. Grease a small loaf tin very well with coconut oil. Line the bottom with greased baking paper. Add the sugar, egg and lime zest to a bowl and whish until it has a buttery consistency. Whisk in the olive oil and coconut oil_ - if the coconut oil is still warm be sure to add it in bit by bit at a time to avoid the eggs scrambling_. Next whisk in the lime juice, followed by the ground almonds and desiccated coconut. Stir in the vanilla extract. Put the mix into your greased loaf tin. Bake the loaf for 1 hour then take out and carefully remove the loaf from the tin. Place the loaf on a baking sheet lined with baking paper and put back in the oven for another 30 minutes or until it's densely solid on the outside on all sides. When it's done take out and allow to cool completely. If your blender is like mine mash up the avocado very well before adding to the blender. Add all the ingredients to a blender and blend until completely smooth. Taste and add more maple syrup if it isn't sweet enough for you. Transfer the smooth mix to a bowl or cup and leave in the fridge until the loaf is completely cool. Spread the cream topping on the loaf and leave in the fridge for 2 hours for the cream topping to set completely. Sprinkle with some desiccated coconut when ready to serve. Have with tea. Enjoy! So trying to get the avocado cream smooth in my blender was … a trying experience. Definitely photographs better outdoors. But tastes good wherever. Lime and coconut loaf topped with sweet avocado and lime cream. Lovely with a cup of black tea.